Some critics of consolidation had hoped that, following the collapse of the Comcast-Time Warner Cable merger in the face of opposition from the FCC and Justice Department, that AT&T’s bid for DirecTV would also be blocked. But I don’t think that was ever in the cards. Structurally, the two deals were not comparable and did not raise the same anti-competitive concerns. Both Comcast and Time Warner Cable are cable ISPs — a corporate structure, it is increasingly clear, that both Wheeler and the antitrust division at DOJ find inherently problematic. Broadband providers that are also major video providers have both the means and the built-in incentive to discriminate against other, potentially disruptive video providers. The FCC doesn’t have the authority (although DOJ might) to break up cable ISPs into their constituent businesses. But it certainly doesn’t need to let them merge. DirecTV is a major video provider but a negligible broadband provider. AT&T is a broadband provider, but has a relatively limited video footprint. Their corporate structure, even ex-merger, does not create the same sort of conflict of interest as cable ISPs’ do. 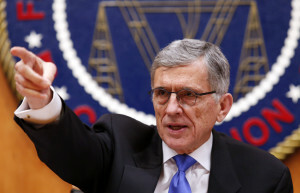 The FCC can still recommend against mergers on grounds they are not in the public interest, of course, but that would have set off a political firestorm at a time when Wheeler has plenty of those on his hands already, and AT&T would likely have litigated the ruling, dragging things out indefinitely. Instead, Wheeler used approval of the merger as leverage to extract some concessions from AT&T. Some critics of the deal argue that the condition prohibiting AT&T from exempting its own video services from data caps on its fixed broadband lines is no concession at all since AT&T does not currently impose data caps on its fixed broadband subscribers, and because the condition does not apply to AT&T’s wireless service, where it does impose caps. That may be so, but since the FCC did not prohibit so-called zero-rated services on wireless broadband as part of its net neutrality order it would have been difficult to impose such a ban exclusively on AT&T now. If you were feeling generous toward Wheeler, moreover, you could imagine there’s a method to his madness: If your main concern is to disrupt the anti-competitive gravity at the core of cable-ISP companies, encouraging the development of wireless video services may be the best of the not-great-but-plausible options. Over-the-top services like Sling TV, PlayStation Vue and the forthcoming Apple TV service are certainly nice to have. And Wheeler is doing all he can to encourage their development by pushing to classify them as multichannel video programming distributors. But insofar as most usage of such services will still rely on fixed broadband connections provided by cable MSOs, they won’t dislodge the current gate-keepers. The FCC has already addressed discrimination against such services, moreover, in its net neutrality order. Robust wireless video services, on the other hand, have the potential to break the monopoly that Comcast, Time Warner Cable, et. al., have on their end users for the delivery of video, whether via IP or cable plant. With his background as a former lobbyist for the cable industry and the wireless industry, Wheeler certainly understands the hard economics of standing up a viable competitor to an entrenched cartel. He also understands that, until the incentive auction eventually dislodges more bandwidth for wireless services, wireless bandwidth may need to be managed more actively than wireline bandwidth to accommodate data-intensive services such as video. As ugly as it sounds, allowing zero-rating and sponsored data plans on wireless platforms, at least in the short term, may be a necessary price for speeding the development of an alternative video pipeline. To be sure, Verizon and AT&T — the biggest beneficiaries of that policy — are no one’s idea of tribunes of the masses. As a practical matter, substituting wireless video service for fixed-line providers may simply substitute one gatekeeper for another. But at least in the aggregate it would increase the number of gatekeepers — and more importantly the number of gates — thereby diluting the leverage of any one. The merger of AT&T and DirecTV, moreover, will create a wireless company with sufficient scale in video to compete effectively for content rights with the likes of Comcast. That’s obviously a far from perfect solution to the problems created by cable-ISPs standing astride both the traditional and over-the-top avenues for the delivery of video. But if the long-term goal is a genuine wireless alternative to Comcast, as I believe for Wheeler it is, then AT&T-DirecTV is the dirty deal you make.